This little boy had a wonderful day yesterday. It started off waking up in Mom and Dad's room because a sleep over is a tradition on Christmas Eve at our house. That way we won't bother Santa when he comes with presents. 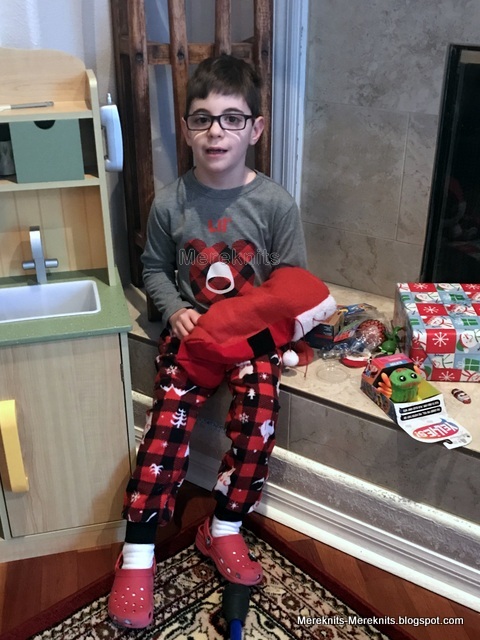 He waited patiently til 9:00 for the older kids to wake up and then walked into the family room to find a kitchen, his stocking and a yellow blender with green on top and a red button. Yes, it had to be that specific one. The kitchen was almost a Christmas disaster as it was missing half the directions when Santa's Elves tried to put it together on Christmas Eve. So a helper had to download new directions, which weren't quite the same or in the same order. It took thee Elves, with multiple degrees in education, to get this baby together and advert a Christmas disaster. There was quite a bit of swearing and laughing too as three adults had to contort themselves to hold pieces together to be screwed in place. It is a lot smaller than I expected but it works and this little one has been very, very busy cooking and making smoothies. He also got a camera from my friend Lynda in North Carolina. A very, very simple one. Yesterday he too 168 photos all of which were very interesting. He has it figured out even though it is really for a right handed person and his right hand doesn't work all that well. It is so great to see his perspective, all the photos are taken from interesting angles. 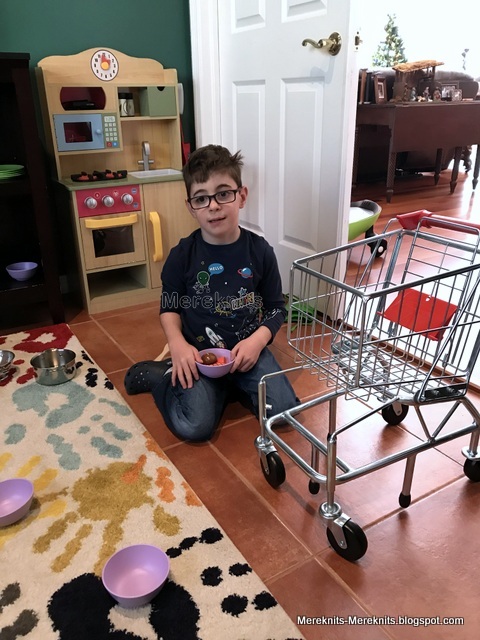 He got remote control cars, pots and pans, dishes, food, two different buses and so much more. We had recently passed on toys that he had grown out of so there was plenty of room in his room to add all of his new things. He has been very busy! This was our first Christmas with Hank and Bear. They had a wonderful time and got lots of things to chew on. 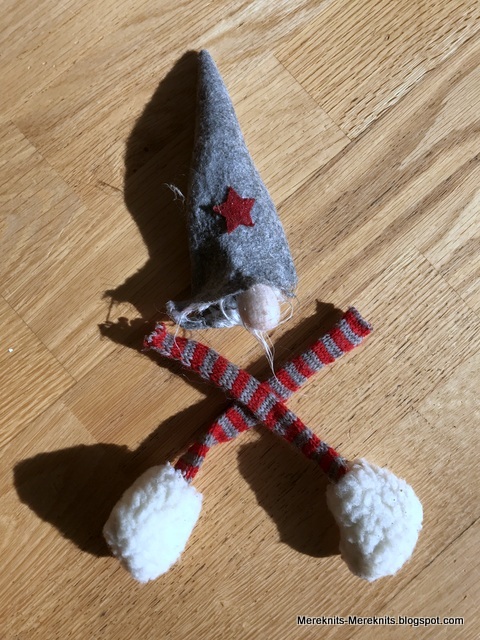 Yet they still seemed to get the little gnome out of my son's girlfriends stocking and rip it to shreds. The poor little guy never stood a chance. Luckily Santa had another one that quickly replaced this one. Today is quieter, not quiet, but quieter. I got my husband and Amazon Echo Show for Christmas so as I am cleaning up and organizing here and there I can listen to music, and of course I can hear Little Buddy asking Alexa all sorts of questions. "Show me a picture of a high speed elevator. What sound does a broken elevator make?" Poor Alexa, she has no idea what to say to these types of questions. So we often resort to, "Alexa, tell me a knock knock joke!" I am back to work tomorrow and I have to say I am not ready. I feel a bit mad as I have been ill most of my six days off. I feel cheated somehow, but that is life isn't it? At least I am well enough to go back tomorrow. My oldest is working today, Mr. 21 and his girlfriend have headed back to Orlando. She will work a few days and fly off to see her family in Indiana for a week. Mr. 21 comes back on Friday for a day or two before he heads out on a cruise to celebrate his best friend's 21st birthday with his family. Oh, to be young again! This lovely rocking sheep was a gift from Lynda in North Carolina. She said she is doing everything I like to do, rock and knit with my reading glasses on, so true! I hope you all had a wonderful day. For those of you recovering from sudden surgery or who have had some issues and are in the hospital, I want you to know I am thinking of you. You know who you are and I am sending you healing thoughts. Have a peaceful day my friends. He looks adorable. I love the clogs. That little sheep knitting in a rocker is so sweet. What a thoughtful gift. Oh what a lucky boy! I can see he absolutely loves to play with his own kitchen.. those poor elves must have had quite a time getting it together.. who was the construction boss? :-) I knew immediately what those two legs and hat belonged to and what happened to it. 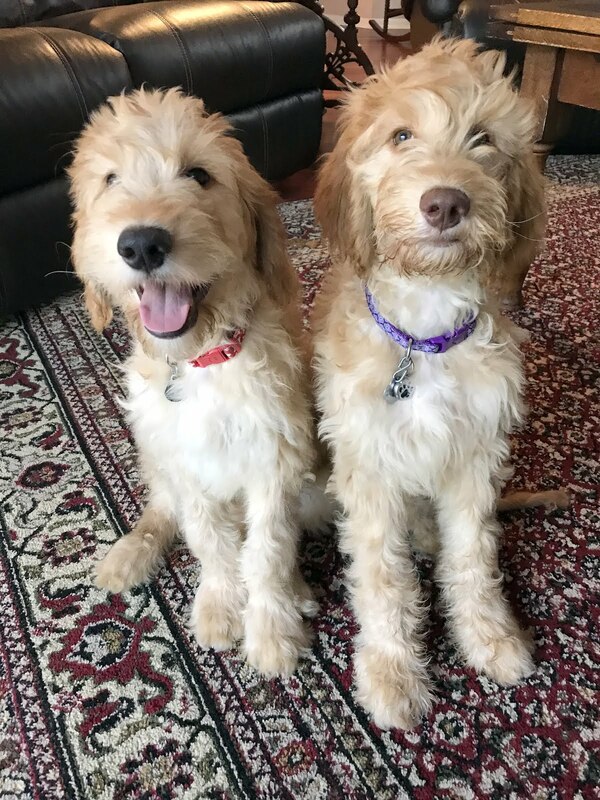 You have two Irish-French Shredder-doodles! I'm sorry that you were ill during your vacation days.. that is just not fair. But I am glad for your 4 days off.. be sure to relax the whole time! We had that very kitchen for our preschool when we first opened and it lasted quite a few years with many, many children playing with it each day. Little buddy will love it! Your story of putting together the blender was great and reminded me of all the years we had to put toys together on Christmas Eve. Thanks for the laughs! Wishing you and your beautiful family a Happy New Year and all the best for 2019!! It looks like a wonderful Christmas. We had a good one here also. Lots of toys and so much fun. Hugs and Kisses and thank you's came my way. I am blessed. Hope you continue to feel better and maybe you will get some rest this coming weekend. Glad you all had a good Christmas, even with the surgery we did too. I'm still sore, but I'm healing. Little Buddy looks so BIG next to his shopping buggy. I guess he has grown quite a bit since we saw him. You had a wonderful day, didn't you?! I'm sorry you had to head back so soon! 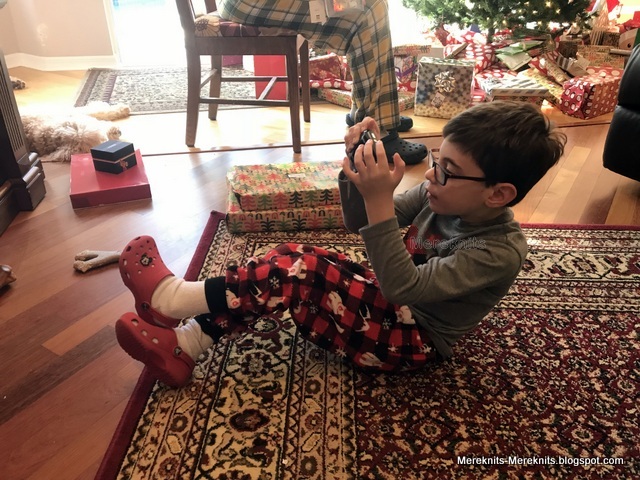 I think cameras are wonderful gifts for kids. They see the world so differently and it's a great way for them to express themselves! Oh, how I remember the years of putting together toys on Christmas Eve. I can honestly say I don’t miss that part very much. Ha! However, I do miss the expressions of joy when the little ones found Santa’s gifts the next morning. Your little guy looks thrilled with all of his new things. I’m so sorry you were sick most of your time off Meredith. It isn’t fair. You do so much for so many people and I wish you would’ve been able to enjoy your time off more. It sounds like Little Buddy had a wonderful day and I'm sure his new toys will get plenty of use. It's a shame you have to go back to work so soon though, Mick's work closes down between Christmas and New Year so we always have a good long break at this time of year and it's something we're always very grateful for. Christmas with dogs and littles is always busy, busy, busy! You'll need to go back to work to feel rested. 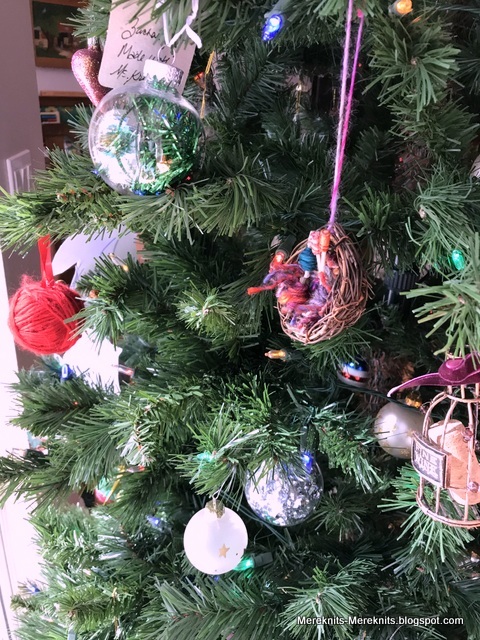 Love that knitting sheep ornament; it is perfect. Find some peaceful time, friend. A camera! What a fantastic idea. Great for his thought process and artistic side! All our furry pets come with a disclaimer: there will be messes and they are worth it. I think your pups are doing very very well. Glad Mr 21 will be returning quickly. we have the joy of Bear kitten for a bit more. I have no idea when zach is going back and I dont want to know! Ahhh.... what fond memories I have of playing with my childhood kitchen. Looks like Little Buddy had a great Christmas! I'm sorry you were under the weather for it. Seems like there's a lot of icky illness going around. Hope you're feeling better soon! Sounds like everyone had a great Christmas! Sorry to hear you were sick on your break - go figure, right? Your body was probably like, "I've had enough!" Love that sheep gift that your friend sent to you. a treat as always. I usually smile or laugh throughout your posts. and seeing Chef Little Buddy with his kitchen and hearing about the challenge it presented was funny! good practice for their own future Santa DIY's. Soon after Christmas, Japanese people start preparing for the year-end and New Year’s events. Compared to Christmas, many of these events are based on Japanese tradition and are deeply related to religion. The end-of-year party is called “bonenkai” in Japanese. “Bonen” means to forget (the worries of) the past year. People are busy with events on New Year’s Eve. 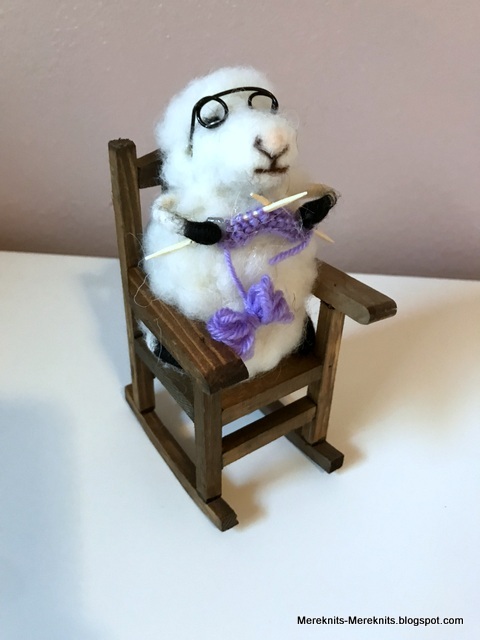 That little sheep knitting in a rocker is very sweet. Sounds like a wonderful holiday at your house. Good thing that you cleaned out some toys! And I can't believe you had to assemble a blender. I thought they came assembled! I don't blame you for feeling cheated after being sick for much of your break. And you have my sympathies for only getting 6 days off. We are back up to two weeks for winter break and it is absolutely luxurious -- not to mention good for my physical and mental health. Holiday greetings, Meredith! Merry Christmas - it is so magical for our little ones. Thank you for sharing the magic that happens at your place. The family portrait in the background of one of your photos particularly touched me - family is precious and this is acutely felt at Christmas. Your rocking sheep is also adorable (and meaningful). 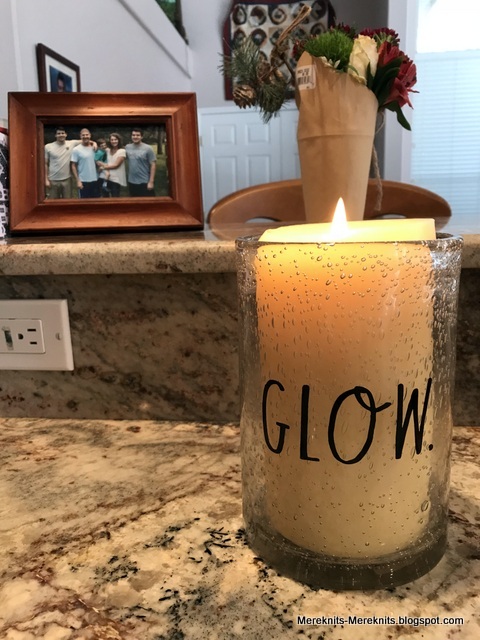 Such a thoughtful gift from Lynda. The fact that LB is also adorable (and growing quickly) goes without saying! Wishing you all fun at New Year and a happy 2019. He looks like he was really enjoying himself. Sounds like you've all been very busy. Hope you are over the illness soon.